2015 didn't go off to a good start when it comes to running. The last time I felt motivated to run was before We Own The Night last May in London. The amount of times I went out for a run can probably be counted on both hands. The less I run, the more I start to dislike it because whenever I go for a spontaneous run I'm exhausted since my body isn't used to it anymore. But the last two weeks, I picked up running again and I "blame" the weather. 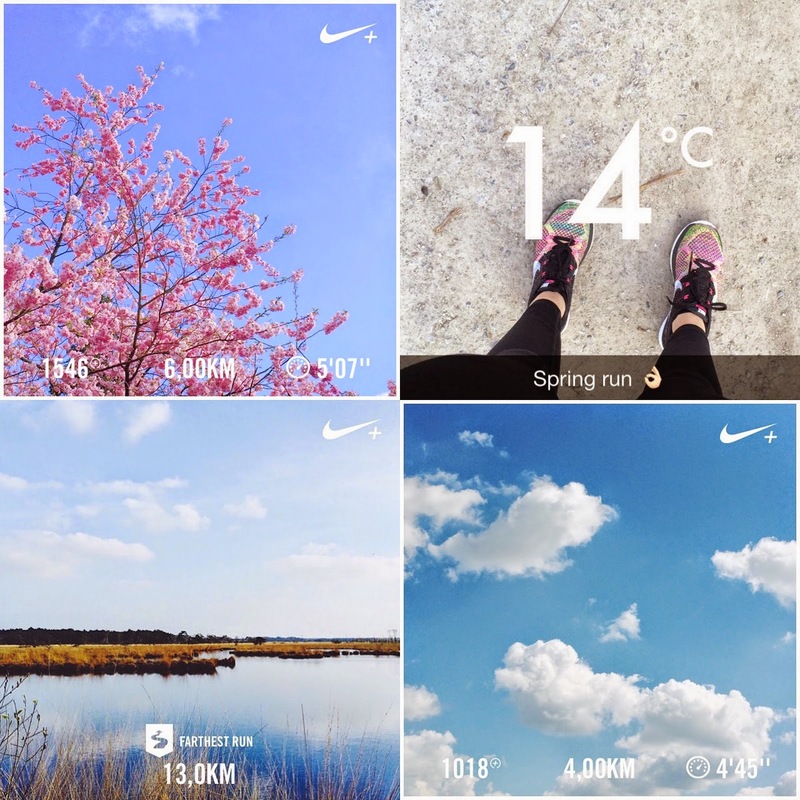 Is spring turning me into a runner again? I'm definitely someone who only likes to run with ideal weather conditions. Sunny, not too hot and not too cold. Not right after I've eaten and also not when I've worked out my legs the day before. And of course not in the dark, which makes it difficult to go for a run after work in the winter. BUT now it's spring, still light when I get out of work so there's no excuses to incorporate the occasional run into my exercise routine. I still prefer a good workout at the gym, but a nice run on a Saturday morning can be pretty nice too! Last week I was in Belgium for Easter holidays, and went running twice and did a Kayla Itsines workout twice (mainly because there's no gym where I could go back home). On the second run, I joined a friend and she suggested to go for a little round. That little round was so nice, easygoing and relaxing (while catching up!) that it turned into 13 km, my longest run ever ever! It was painful at the end, but I surprised myself because I didn't know I could ever make it past 10 km. I still haven't got any races planned (my number one motivation to run probably), but I need to sign up for one soon! I'd love to do a Nike 10 km race again, but since I live in Munich now I'm not sure if I'll get the opportunity. So I'm thinking about a 10 km run somewhere in June, in Munich. I'd also love to run half a marathon once but I still don't know when/where I should/could do that. My love affair with strength training is still bigger than my motivation to run, so right now running isn't priority. But who knows, maybe I change my mind in a few months? Are any of my readers avid runners? Got any advice for a doubting runner like me?